Wednesday is a day that many college coaches around the country are waiting on as it’s the first year for an early signing period that starts on Wednesday and runs through Friday. 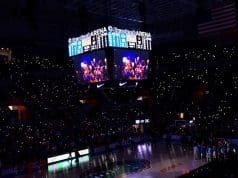 The Florida Gators are one team that expect to have a good early signing period as many of their commits are planning to sign early. 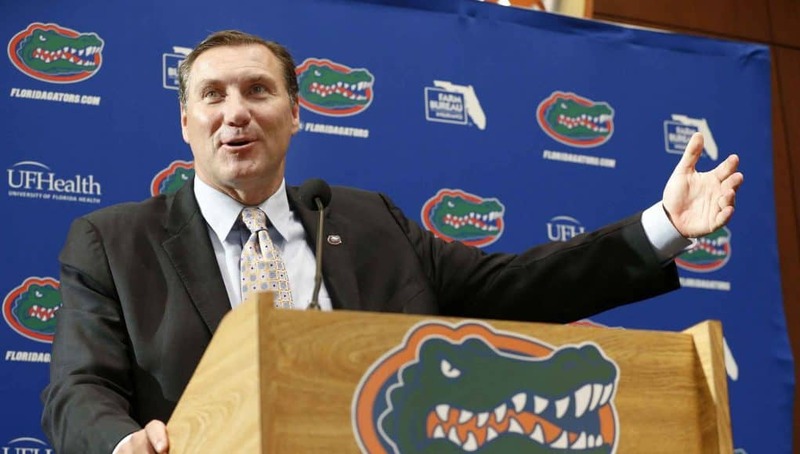 Florida is also in the mix for several key targets that plan to announce on Wednesday. GatorCountry takes a look at which commits are expected to sign early and what targets are announcing on Wednesday. One thing to remember is just because a commit signs early, it doesn’t mean that they will early enroll in January. Signing early just shuts down their recruiting process. Here are the guys expected to sign early on Wednesday. Running back Dameon Pierce- Pierce is an early enrollee guy so he will sign on Wednesday and than enroll in school in January. Pierce has been solid to Florida since committing over the summer. Running back Iverson Clement-Clement is also an early enrollee in January for Florida. Clement has been a leader of the class since committing to Florida. Tight end Kyle Pitts- Pitts isn’t an early enrollee but plans to sign on Wednesday. Pitts has also been a solid commit since committing to Florida in July. Tight end Dante Lang- Lang like Pitts won’t early enroll but plans to sign on Wednesday. Lang took an official visit to Florida last weekend and had a great trip to solidify his commitment. Offensive lineman Chris Bleich- Bleich was the first commit under Mullen and he plans to enroll at Florida in January to give the Gators much needed help at the position. Bleich is a guy that can play tackle or guard in college. Linebacker David Reese-Reese plans to sign on Wednesday but isn’t an early enrollee guy. Reese will enroll in June to give the Gators depth at the linebacker position. Defensive back Randy Russell-Russell plans to early enroll in January and sign on Wednesday. Russell took an official visit to UCF over the weekend so that’s something to watch down the stretch. Defensive back Amari Burney-Burney like Russell plans to early enroll at Florida in January. Burney has been a constant leader of the class and active recruiter for the Gators since committing in June. Defensive back John Huggins- Huggins is the big surprise early signer as he had no plans to sign early until he committed to Florida on his official visit to Gainesville over the weekend. Huggins has been made a priority by defensive coordinator Todd Grantham since he arrived in Gainesville. Huggins isn’t an early enrollee guy. Kicker Evan McPherson- McPherson will sign early on Wednesday but isn’t enrolling until June at Florida. 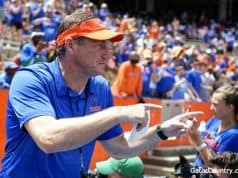 McPherson has a close connection to Dan Mullen and that sealed the deal for Florida. The Florida Gators also have a chance at these three prospects who will all announce their college decision on Wednesday before signing. Ohio State quarterback commit Emory Jones-Jones took an official visit to both Florida and Florida State this weekend and he plans to sign on Wednesday and early enroll. Florida made a good impression on Jones this weekend and have some confidence heading into his 11:30 decision time on Wednesday. Alabama is also in the mix for the Ohio State commit. Arkansas offensive line commit Noah Banks- Banks also plans to commit and sign on Wednesday before early enrolling at a school in Wednesday. Banks visited both Texas and Florida this weekend. Both schools are confident heading into the decision. 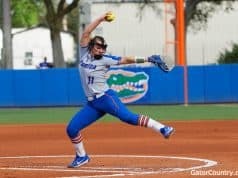 The one key thing to remember is that Banks is from Pensacola, Florida and grew up watching the Gators. Defensive back Trey Dean-Dean will announce at 11:30 with Jones in Atlanta on Wednesday morning. Dean brought his whole family on the visit this weekend and the Gators impressed him a lot. Florida has always been a school that Dean liked but the previous defensive staff didn’t show him much interest.